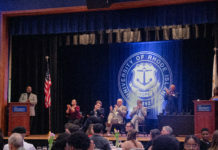 Over the summer, the Department of Housing and Residential Life at the University of Rhode Island decided that Gorham Hall would be used for international and transfer student residents. Last year, the residence hall was used for first-year students and was the Living and Learning Community for business students. This year, Adams and Bressler hall will serve as the residence halls for the business LLC. Gorham Hall is perceived by some as an old and outdated building that is falling apart at the seams. It is known as the typical freshman dorm but, some incoming students were not very pleased about the placement. Going into living in Gorham, I was not excited because I knew it was known as “the dungeon” but, I ended up not absolutely hating it,” former Gorham Hall resident Amelia Crosley said. With the help from Crosley’s roommates, they were all able to get by and made the best out of the situation. Crosley did mention that the air conditioning did not work and they were mice in her room at one point. The decision to relocate the LLC was a joint decision between the Department of Housing and Residential life and administrators at the College of Business. “The decision to relocate the Business LLC to Adams and Bressler was made at the request of our academic partners in the College of Business,” Director of Housing Frankie Minor said. Administrators at the College of Business realized that their students should be living in a building that has a functional space to be able to gather for study groups, residential advisor meetings and more. Bressler Hall, specifically, contains two large lounges that can be used for those purposes. Adams Hall is similar. These factors of the two dorms help business students to connect with each other more and give them an overall better experience for their first-year. The location of Adams and Bressler Hall allows students to be in the center of all the action on campus. This was a significant switch from where the Business LLC used to be, in Gorham Hall, which is at the very bottom of campus and separated from the rest of the university. With this change of housing for the business LLC, the Housing and Residential Life department needed to fill Gorham Hall with other students. They decided that transfer and international students would live there. Students who were on the waitlist that are accepted last minute will also be placed in this dorm in order to have a spot readily open for them.